Prof. Zhou Zeyang, President of Chongqing Normal University and Mr Nalin Aponso, President of the SLCJF have signed the MoU on behalf of each party. According to the signed MoU, CNU has recognized SLCJF as its official representative in Sri Lanka. The MOU will enable the opportunities for both parties while keeping Belt and Road initiative as the main platform. Mr. Liu Dong, Head of Cultural Section at Embassy of People’s Republic of China in Sri Lanka; Prof. Guan Pin, Director of Office for International Cooperation and Exchanges; Prof. Lei Yong, Dean of International College for Chinese Language and Culture; Dr. Yu Haikuo, a teacher of International College for Chinese Language and Culture, several representatives of the Confucius Institute at University of Kelaniya in Sri Lanka, including its director Wang Wanxia, and several members of the SLCJF were also joined this significant event. During the discussion, both parties agreed for exchange programmes. 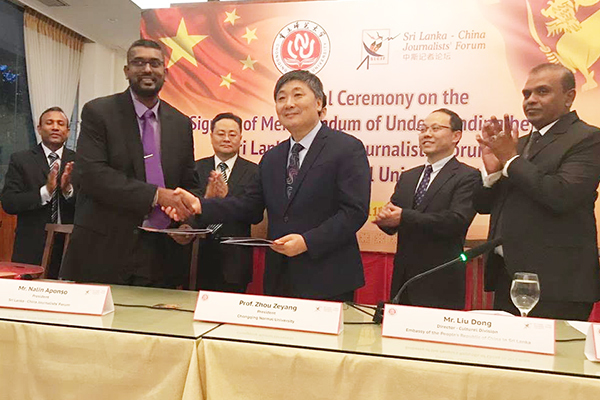 Therefore, CNU will offer around 20 scholarships through SLCFJ for carrier journalists working in Sri Lanka annually. These residence programmes will be opening up the opportunities to earn deep knowledge and understanding on China including her cultural and economic values. Meanwhile, both parties have acknowledged the importance of opening a local branch of CNU in Sri Lanka in the future.